Does anyone control themselves at local farmer’s markets and fruit stands along the highway or even in the freezing produce aisles of the grocery store? Which makes me beg the question…why are grocery stores so darn cold in the midst of summer? I, no joke, along with my grocery bags and list, tote along an Old Navy fleece pullover. I, however, forget the pullover as often as I forget the reusable grocery bags and list. But I digress…The fruit and vegetables – I want all of them! Every last one. Like bushels…can one have too many peaches or plums? How about tomatoes or sweet corn? I just don’t seem to have a limit … my eyes are 17 times the size of my stomach May through Septemeber. Anyone else with this problem? Like everyone, right? Right now, on my kitchen counter there is 1 honeydew. 3 pluots. 2 plums. 4 ears of corn. 2 heads of romaine. 4 bananas. 2 avocados. I am one person. One person who will be eating quite well for the coming week…hopefully, before any of it turns and the fruit flies appear. Because, seriously – where do they come from? They confound me as much as the frigidness of the grocery this time of year. Last week…I overbought peaches and after clearing out the freezer because I also overbought popsicles…I found a bag of frozen mixed berries. 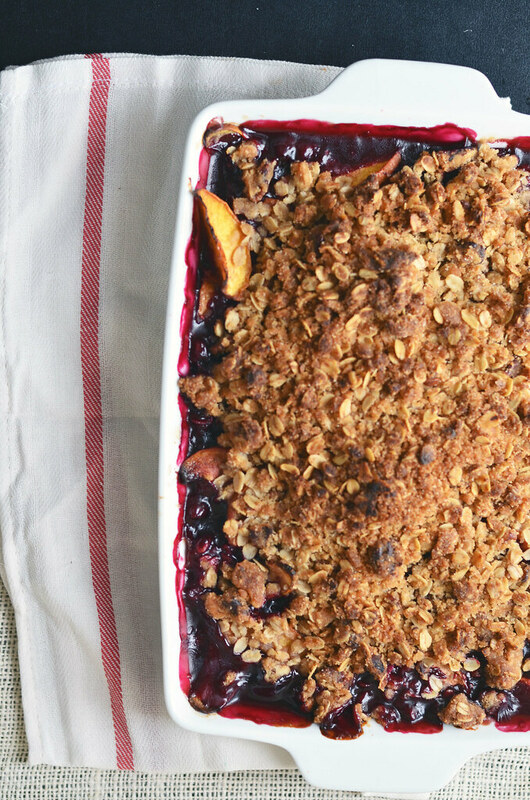 My simple peach crisp – which was inevitable and perhaps the true reason why I purchased too many peaches at the farmer’s market – quickly became a peach and mixed berry crisp. The sugary sweet ripe peaches with golden flesh were perfect with the tart bright berries that were frozen at their peak ripeness and saved just for a moment like this. Crisps are splendid because of their no-fuss uncomplicated topping that can be brought together quickly and without much thought and can actually be made in large batches, frozen alongside extra berries and popsicles from gluttonous trips to markets. For the first time, I melted extra virgin coconut oil instead of butter to bind the ingredients together and I am not sure when I will be using butter again in my crisp topping. Perhaps just for apple. 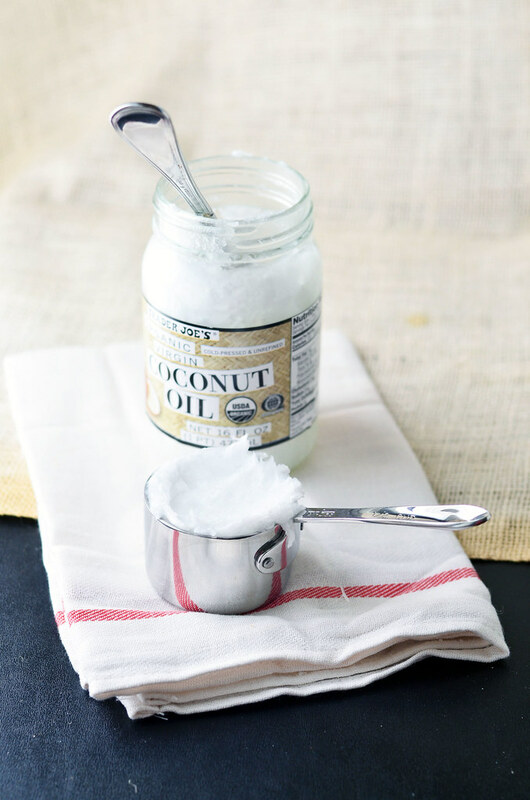 Extra virgin coconut oil is unrefined allowing that unmistakable coconut-y scent and flavor permeate the air and eventually any dish you prepare with the oil. If coconut is not your jam and you are trying to avoid butter – I would recommend baking with expelled and pressed coconut oil. It is further refined and does not have the flavor or scent of coconuts – which is depressing to me, but may be perfect for you. All you need once the crisp is baked and just slightly cooled is very very good vanilla ice cream and a spoon. Bowls and manners are slightly optional. 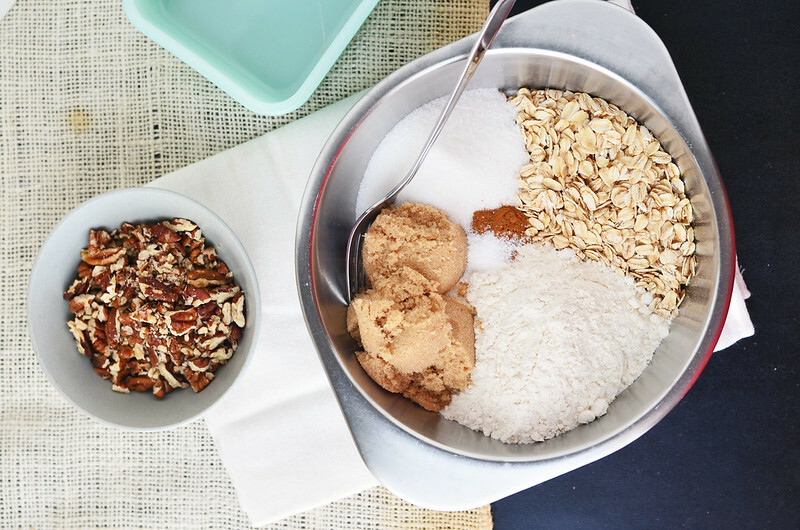 That measuring cup smells like a good beachy summer day. Piña coladas and Banana Boat. It’ll need to be melted … which I did in an oven safe bowl along side the pecans as they roasted. 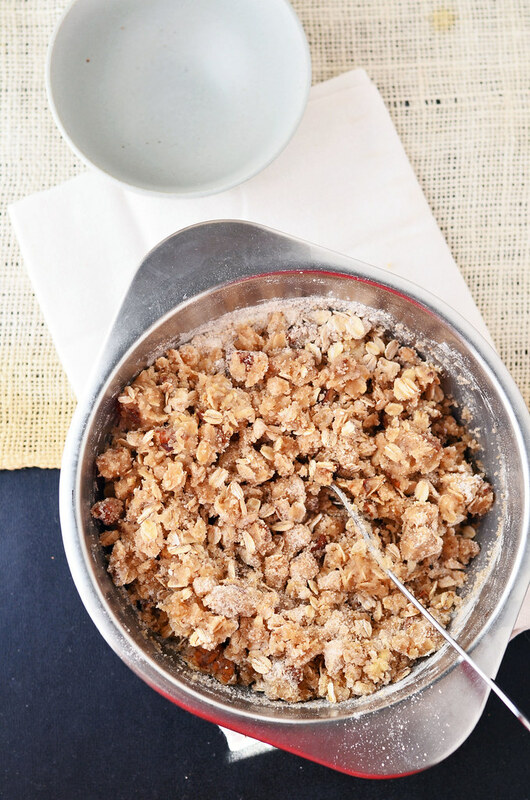 Meanwhile…flour, oats, brown sugar, salt, and a touch of cinnamon are whisked into one. And melted coconut oil that is slightly cooled. The urge to simply bathe in the oil is quite compelling at this point, so beware. The melted coconut oil brings the whole lovely mess together. Into the fridge this shall live until the filling is prepared. 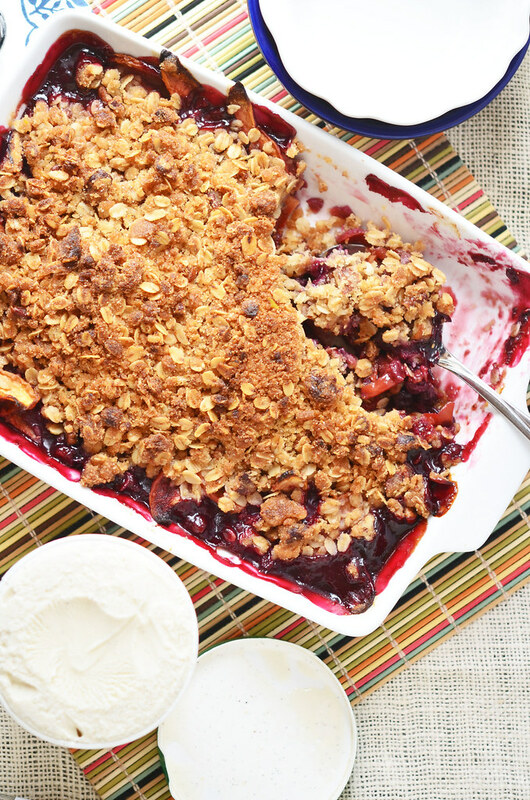 Too many peaches and berries are no longer a problem when there is a crisp in the making…. 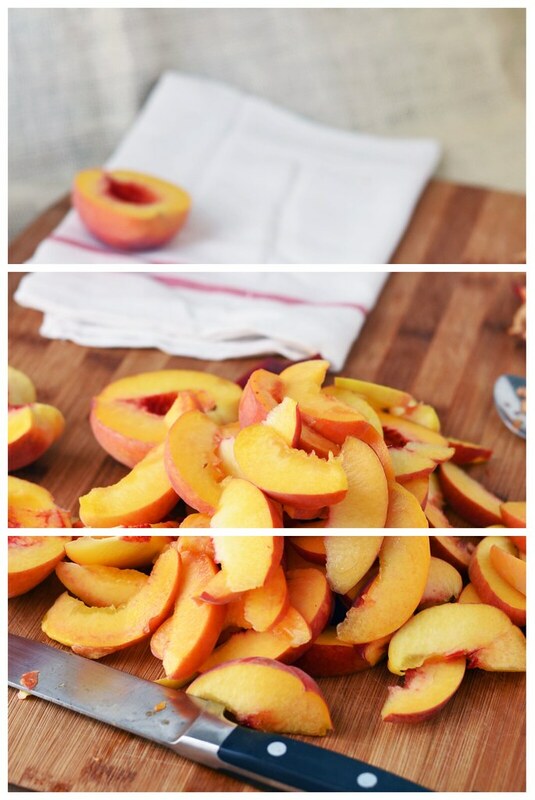 Most satisfying feeling in the land…slicing a peach, turning it, and separating the peaches into two halves with very little effort. Most frustrating feeling in the land….slicing a peach, turning it, and nothing…not even a budge and then squeezing and twisting with too much strength causing the peach to bleed juices and become bruised. I had a good even mix of satisfaction and frustration with these peaches. I believe it was a wash.
Slice peaches as evenly as one can do and eat as many as you deem fit. 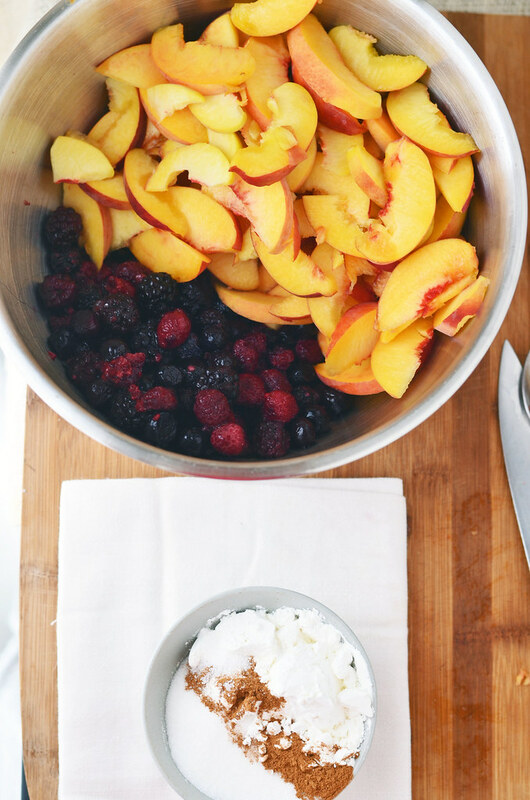 Peaches and berries in one bowl. Sugar, corn starch, and cinnamon in another. 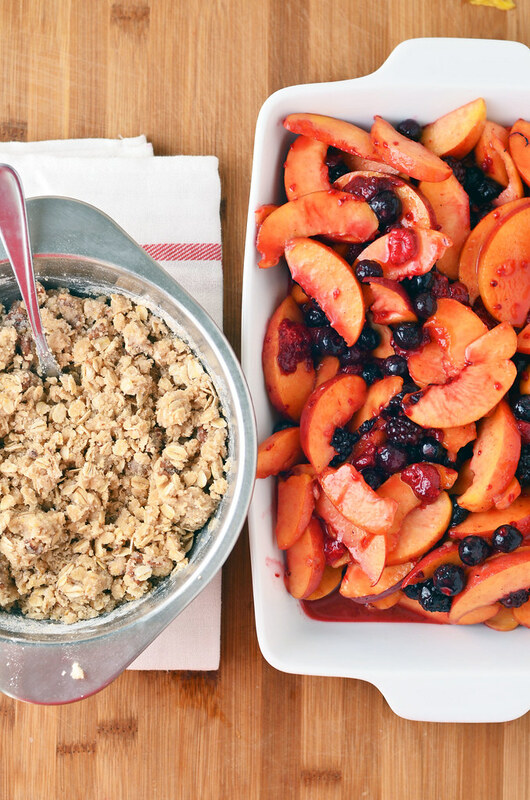 Dry ingredients and fruit…mix to combine. Peaches become purple. Layered and into the oven we go. 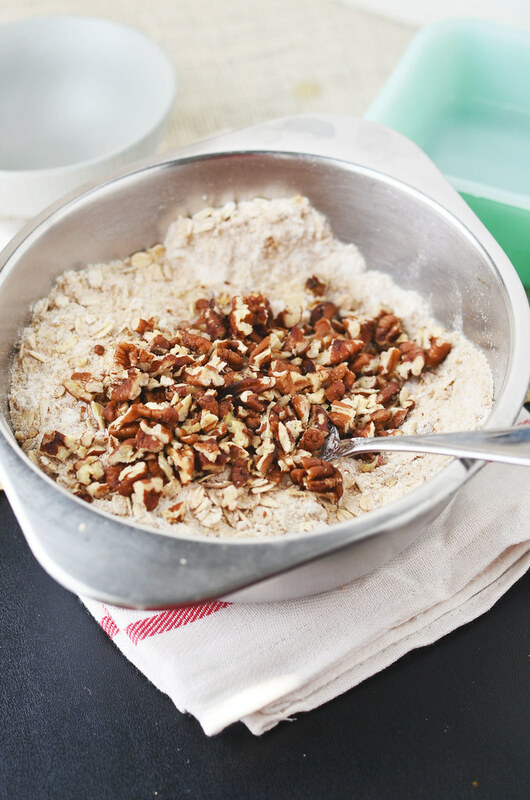 Spread pecan halves on a baking sheet in a single layer. Place in oven and roast for about 5 to 7 minutes until fragrant. Remove from oven and let cool. Roughly chop. 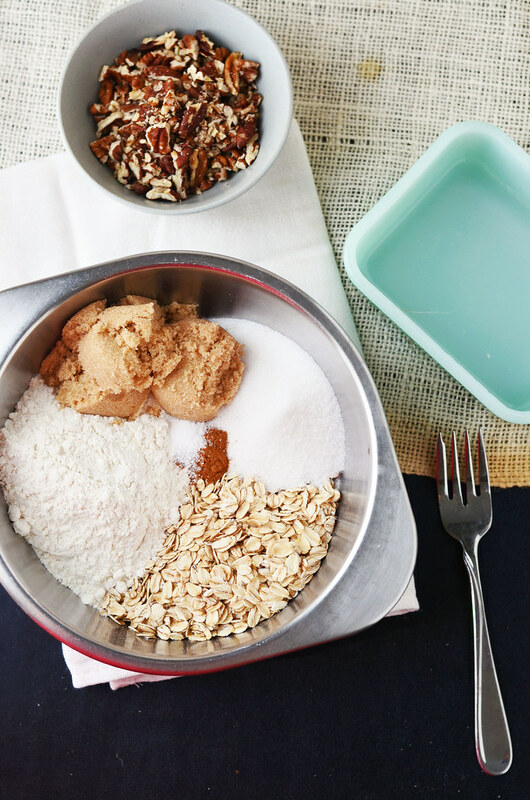 In a large bowl, whisk together oats, flour, brown sugar, salt, and cinnamon. Add pecans and toss to combine. Pour melted coconut oil over dry ingredients and with a fork, stir ingredients together until the dry ingredients are moistened and begin to clump together. Place mixture into refrigerator and prepare fruit filling. Pit and thinly slice peaches. I prefer to leave the skins on the peaches as this makes the recipe less fussy. Peel if you prefer. 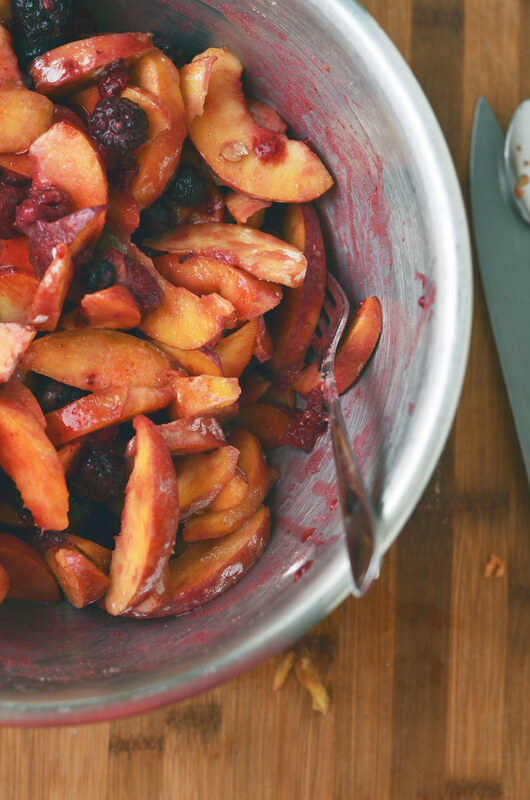 In a large bowl, toss together peaches and mixed berries. In a small bowl, combine cornstarch, sugar, cinnamon, and salt. Stir to combine. 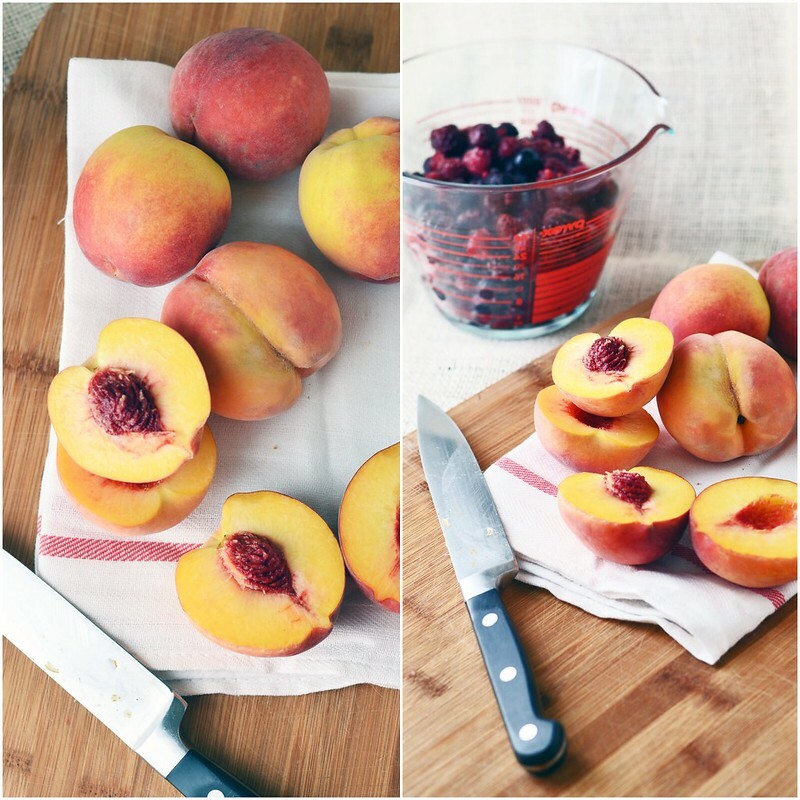 Sprinkle dry ingredients over fruit and with a wooden spoon or rubber spatula, carefully toss to combine. 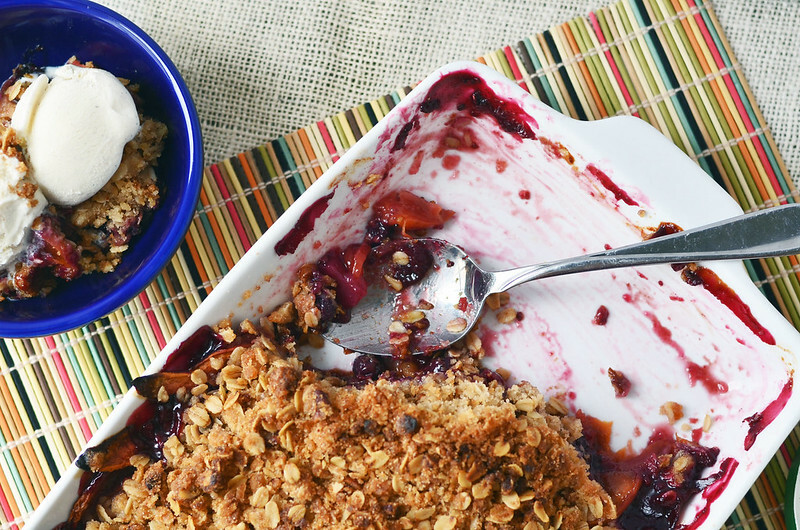 Pour fruit filling into a 9x9 square pan or a 10 inch deep dish pie plate. 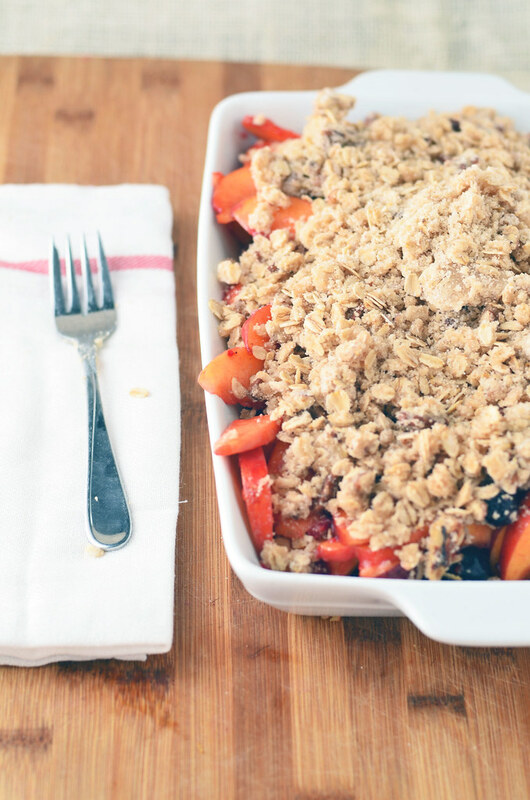 Carefully scatter crisp topping over fruit filling. Place in preheated oven and cook until topping turns golden brown and the filling begins to bubble around the edges - about 55 to 60 minutes. If topping begins to brown too quickly, tent with foil. Remove from oven and let cool for at least 15 to 20 minutes before serving. 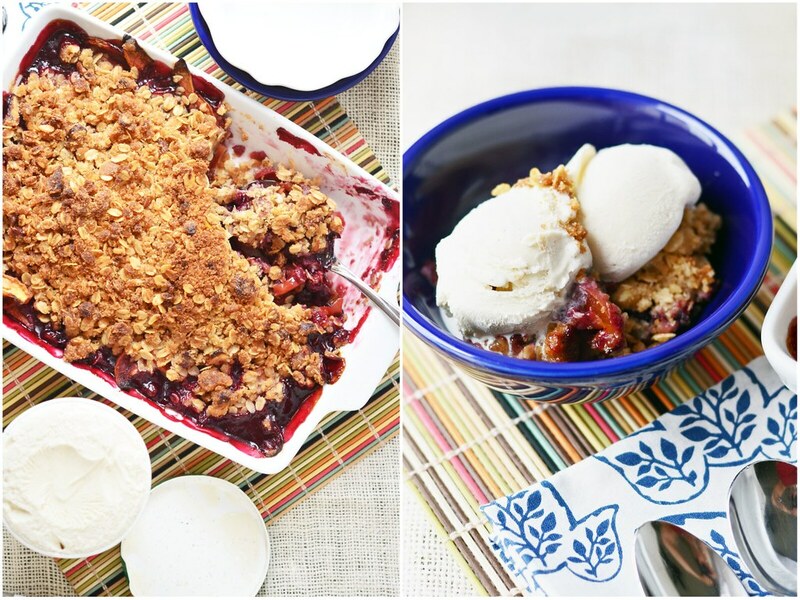 Serve with vanilla ice cream, warm (best) or at room temperature (absolutely OK, too).